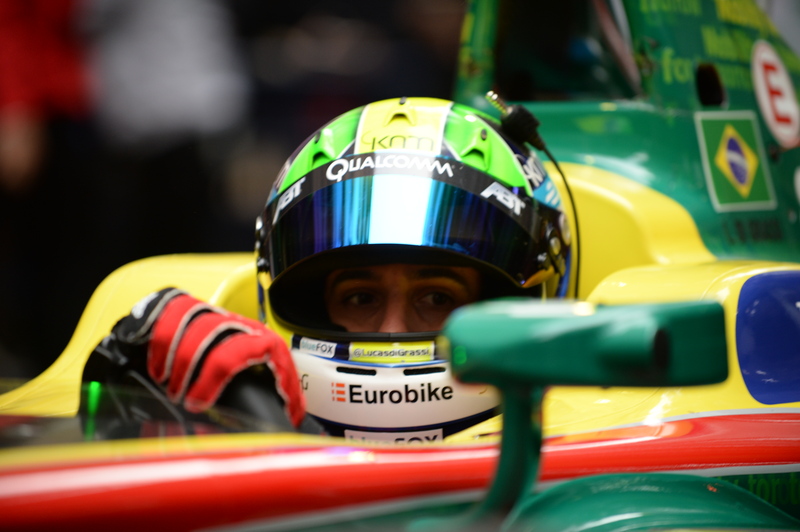 Lucas di Grassi claimed his first pole position in Formula E after a turbulent qualifying session. Jean-Eric Vergne, who had been the fastest after the group stage, will start alongside him from second place. Sebastien Buemi finished the session in third place ahead of NextEV duo Oliver Turvey and Nelson Piquet Jr. The first part of the qualifying session was contested by Sam Bird, Maro Engel, Mitch Evans, Robin Frijns, and Adam Carroll. Bird seemed to be on top with a lap time of 1:09.839s, but Evans edged past him and beat the Englishman by three tenths of a second. Frijns was third fastest ahead of Carroll, and Engel was the slowest out of the five drivers due to stopping on track. The second qualifying group seemed to become a battle between giants Buemi and di Grassi. 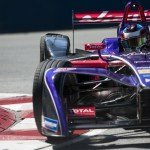 The Swiss driver set a benchmark with a purple first sector. di Grassi responded by going faster in the second sector, but it was Buemi who took provisional pole position with 1:09.018s and di Grassi slotted into provisional second place, seven hundredths of a second behind. Piquet Jr finished behind the duo with a lap of 1:09.383s, and Jerôme d’Ambrosio slotted into provisional fifth place behind Evans. However, it was Jean-Eric Vergne who claimed the spotlight. The Frenchman was the last of the five to lap the circuit and made good use of the clear air to catapult himself up to the top spot, beating Buemi with a time of 1:08.751s. However, both Piquet Jr and Vergne came under investigation by the stewards, so that the start of the third qualifying group was delayed. When the lights eventually went green, there was a short interruption of the warm-up laps as Antonio Felix da Costa stopped his car on track, but the Portuguese driver was able to reset his car and keep going. José Maria Lopez, who had already been the fastest in the first free practice session, set a purple first sector time in his flying lap, however it all came undone when the local hero clipped the wall and ended his chances for pole position with a broken suspension. Felix Rosenqvist finished the red-flagged session in provisional sixth place, just less than two tenths of a second off Evans’ pace. Stephane Sarrazin finished in provisional ninth place. 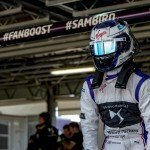 Loic Duval slotted into 11th between Frijns and Carroll. da Costa was allowed to repeat his flying lap after the track had been cleared, but he was not able to improve after puncturing his tyre by touching the barriers, remaining in 13th. Lopez finished the session in 14th place and has to report to the stewards. Nico Prost led the way as the final qualifying group got underway and took to the track after a short delay. His fast lap brought him up to provisional fifth place. However, he was beaten to the super pole shootout by Oliver Turvey who slotted into fourth place, seven hundredths of a second faster than the Frenchman. Nick Heidfeld put his car into 12th place on the starting grid, and Daniel Abt finished the session down in 16th place after clipping the wall in the same place as his team mate in the second free practice session. Ma Qing Hua will start from 19th place behind Lopez after having contact with the wall as well. The start of the super pole shootout was delayed due to a bollard in the chicane being removed. Piquet Jr was the first man on track and set a benchmark lap time of 1:11.274s. Turvey was the next driver on track and put himself on provisional pole position, over a second faster than his team mate despite a lock-up during the flying lap. When it was di Grassi’s turn, the Brazilian bettered Turvey’s lap time easily and put himself on the top spot with a lap of 1:09.404s. Buemi was up next, and while he had beaten di Grassi in the battle of their qualifying group, this time he lost out to his rival and slotted into second place, eight tenths of a second behind. Then it was up to Vergne to replicate his feat from earlier and confirm his pole position. However, despite a fastest first sector the Frenchman did not make it and his lap was two tenths slower than that of di Grassi.